AMD holds the crown for game-worthy integrated graphics performance thanks to its Ryzen processors with Radeon Vega technology. Packing CPU cores and GPU resources onto the same die in the right proportions is a perpetual challenge, particularly as modern games push new features that improve realism. AMD strikes a sweet balance this generation, allowing for some insanely cool small form factor builds capable of casual gaming at 1080p. Most of the devices hooked up to our TVs don’t allow us to switch between playing League of Legends and watching our favorite series on Netflix. But AMD’s 14nm Raven Ridge chips offer a huge leap forward by integrating the company’s Zen CPU architecture, Vega graphics technology, and fixed-function hardware to accelerate video playback and encoding. We can finally roll Fortnite marathons straight into movie streaming from a single low-power device. Come Monday morning, we can get plenty of work done in our favorite productivity applications using the same machine. For less than $200, AMD’s Ryzen 5 2400G combines all of that goodness into a Socket AM4-based package, which is why we grabbed one to serve as the foundation for a potent home-theater PC. There is no add-in graphics card to fuss with, so we’re able to focus on building a super tiny HTPC that is smaller than a game console. In fact, the finished build is no bigger than a full size graphics card. A multi-talented processor calls for a well-appointed motherboard, such as the $159.99 USD and $207.99 CAD. Even though we’re using integrated graphics to squeeze into a smaller chassis, if you drop the board into a larger Mini-ITX case, its 16-lane PCI Express 3.0 slot supports a full-size graphics card. Due to their compact dimensions, Mini-ITX motherboards don’t have much room for expansion. 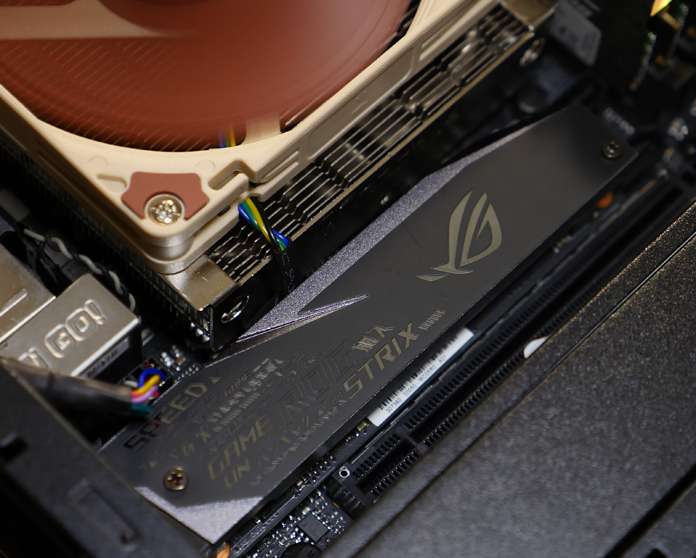 The Strix B450-I Gaming takes creative integration to the next level with a riser card that sits atop AMD’s B450 chipset, elevating the board’s SupremeFX audio engine via stand-offs and supporting a PCIe-based M.2 SSD for on-board storage. Beyond the space this implementation saves, it’s also packed with high-end audio functionality. Dual op-amps drive stereo headphones with input impedance between 32 and 600Ω, while a proprietary S1220A codec can output to an eight-channel surround-sound speaker system in your living room. Wired and wireless networking are built-in, too. Hooking up through an Intel I211-AT Gigabit Ethernet controller is ideal for piping high-bitrate media across the house. But in an isolated TV stand, the board’s 2×2 Wi-Fi setup delivers up to 867Mbps if you use it in a multi-user MIMO-enabled environment. Of course, real-world speeds always vary, but the flexibility to choose between the 2.4GHz and 5GHz bands should help with fine-tuning. I did all my gaming and streaming wirelessly, and had no issue with buffering or skipped frames. 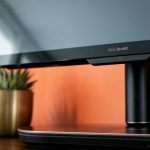 Although windowed cases aren’t prevalent in the HTPC world, we do include Aura Sync LEDs, along with headers to support standard RGB strips and addressable RGB devices. If you do find yourself with a clear view down to the motherboard, pay extra attention to cable management. I had power cables tucked away on the board’s right side, mostly blocking the lighting effects. A bigger chassis would have given me room to route those cables elsewhere. Even with the back-lit board obscured somewhat, I used Aura Sync to match the lighting between my G.Skill Trident Z RGB memory modules and supported peripherals. It’s worth noting that board’s standard strip header can power up to three meters of LED strips if you’d really like to add bling to your PC’s internals. The Ryzen 5 2400G I dropped into this platform’s Socket AM4 interface is the highest-end model that AMD makes. It sports four physical cores with simultaneous multi-threading, allowing the chip to work on eight threads at a time. A 3.6GHz base clock rate boosts as high as 3.9GHz in lightly-threaded workloads, offering a nice speed-up when the headroom is available. Even more interesting to gamers, though, is AMD’s Radeon RX Vega 11 graphics engine. 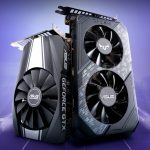 Its 704 Stream processors and 44 texture units operate at up to 1250MHz, matching the performance of modern entry-level graphics cards. Given such a potent integrated GPU, you can expect smooth frame rates in AAA games at 720p and playable performance in most titles at 1080p. The chip’s 65W thermal design power rating is lower than most desktop CPUs, and that benefits our build in several ways. First, keeping power consumption to a minimum makes it easier to pick a PSU. 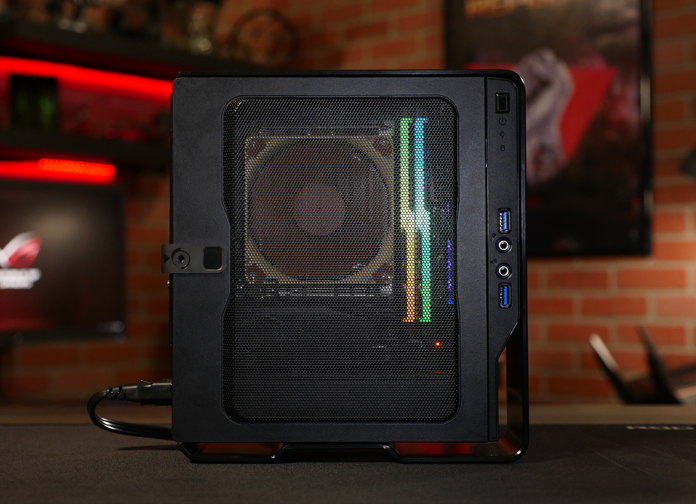 The InWin Chopin case that we’re using to house our hardware includes a 150W 80 PLUS Bronze-rated adapter that’d be quickly overwhelmed by more demanding components, but a 65W processor with integrated graphics is a perfect fit. Low power consumption also translates to less heat. Small form factors don’t have a lot of room for case fans or ideal airflow, and temperatures can rise quickly in demanding applications. Although the Ryzen 5 2400G includes AMD’s capable Wraith Stealth cooler, we substituted in a Noctua NH-L9a-AM4 for its low profile and ability to dissipate up to 65W of thermal energy. The Ryzen 5 2400G underneath it idled at a mere 37°C. Under load, the processor topped out at only 65°C thanks to the cooler’s big 92-mm fan, which that stands just 37mm tall. 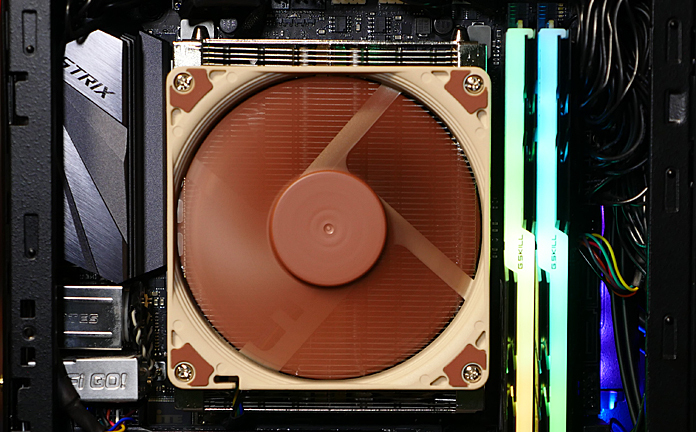 Despite the fan’s diameter, you can still access both DIMM slots on the B450-I Gaming. The cooler doesn’t hang over the PCIe slot either. If you want to add a graphics card at some point down the road (and transplant the internals to a larger case), that’s still an option. The fan header at the top of the board is easy to reach for quick installation. It’s also away from the fan and PSU cables, allowing for clean routing. The eight-pin EPS power connector is in the motherboard’s top-left corner, and I found it easiest to plug into before sliding the board into InWin’s case. Installing the NH-L9a-AM4 proved pleasantly simple, too. I removed the motherboard’s stock backplate, swapped in one that Noctua bundled with its cooler, and bolted the assembly down using four screws. Not bad for a sub-$40 thermal solution! A compact Mini-ITX form factor leaves room for just two memory slots, but because the Ryzen 5 2400G supports two memory channels, we’re still able to tap into its maximum performance. 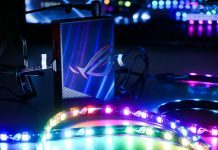 Officially, the ROG Strix B450-I Gaming works with up to DDR4-3600 RAM, though AMD’s specification tops out at 2666 MT/s. 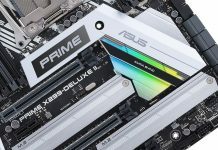 Why bother overclocking RAM on an inexpensive, low-profile HTPC? The Ryzen processor’s on-die Vega 11 graphics engine doesn’t have any local memory of its own, so it shares system RAM with the four CPU cores. Because graphics rendering is a very bandwidth-sensitive application, faster DIMMs are better able to keep the integrated GPU fed with data. The result is higher frame rates in your favorite games. That’s why I selected a 16GB kit of G.Skill’s Trident Z-3200 RGB memory. The DIMMs are stylish on their own with brushed metal heat spreaders, and an exposed light bar adds customizable RGB lighting that nicely illuminates our tiny enclosure. Expect to pay roughly $250 for the Aura-compatible kit. The InWin Chopin case doesn’t have any room inside for bulky 3.5” mechanical disks. Rather, it has space behind the motherboard tray for up to two 2.5” drives. Instead of messing with routing SATA data and power cables, I installed an SSD using the M.2 Audio Combo Card. There’s a second M.2 slot on the motherboard’s back-side, but it isn’t supported alongside Ryzen processors with Radeon Vega graphics. If I wanted more storage, I’d have to use SATA and attached 2.5” SSDs. 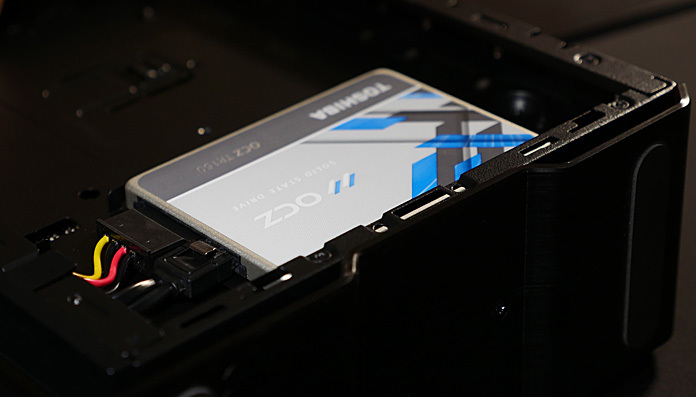 We chose a Western Digital Black 1TB M.2 NVMe SSD with a four-lane PCIe 3.0 interface. It’s capable of insane speeds, reading sequentially at up to 3,400MB/s and writing at up to 2,800MB/s. Even with Noctua’s cooler installed, there’s plenty of clearance for accessing the motherboard’s riser card. It takes just a few twists with a Phillips screwdriver to remove the heat sink and clip an SSD into the M.2 slot. A terabyte of capacity is more than enough for our game library, leaving an abundance of space for our favorite applications, photos, and productivity software. The drive can be found online for $259.99. We really wanted to emphasize compact computing with this build, so we sought out the smallest and most stylish case we could find. It can be difficult to manage temperatures inside of a high-performance, feature-filled PC, but the InWin Chopin we keep mentioning is surprisingly well-ventilated, despite its stealthy footprint. The top portion and left side panel are almost entirely covered by mesh, which is obviously great for exhausting heat. Moreover, the midsection is raised by one quarter of an inch to accommodate taller fans and heat sinks. Those perforated panels provide enough ventilation to allow the case to sit upright or lay flat like a gaming console without any thermal issues. The Chopin stands 9.6” high, measures 3.3” deep, and is 8.6” long. It’s perfect for easy integration with other home theater components in a cabinet or on a TV stand. I set ours behind a 40” widescreen, hiding it completely. We chose InWin’s all-black model over the version with silver brushed aluminum. 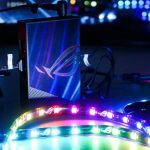 After all, it perfectly matches the ROG Strix B450-I Gaming’s black PCB and our illuminated memory modules. Either one would be an elegant addition to an office or family room, though. This chassis makes the most of its limited internal space with a built-in 150W adapter. The brick-shaped power supply is much smaller than anything you’ve seen in a conventional ATX case, and it has just enough capacity to accommodate mainstream components like the ones we’re using. A 40-mm fan keeps the PSU actively cooled without generating much noise. Naturally, that’s important in a home theater environment. The Chopin features a split layout with its motherboard tray on one side and room for two 2.5” drives on the other. Such a limited amount of space requires a fair bit of homework prior to buying parts, and then lots of care during the build process. The B450-I Gaming is a tiny motherboard and it fit snugly inside the Chopin. Fortunately, standardization means we can confidently purchase a Mini-ITX case and know that the 6.7” x 6.7” motherboard is perfectly compatible. Realizing that it’d be easier to work outside of the case than inside of it, I connected the power cables and CPU fan to our motherboard before sliding it into the Chopin. 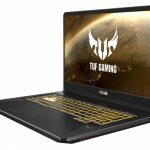 The Strix B450-I Gaming already has four USB 3.1 Gen 1 ports on the back panel, enabled through AMD’s processor, along with two USB 3.1 Gen 2 ports piped through the B450 chipset. Additionally, I connected the Chopin’s front-panel USB 3.0 ports to a dual-port USB 3.1 Gen 1 header on the motherboard’s PCB. I then pulled the PSU’s remaining cables back to carefully seat the motherboard in our chassis, and then hooked up the power and reset button cables. Dropping an M.2 SSD directly onto the motherboard cleaned up a lot of the cable clutter you’d expect, so we definitely recommend taking advantage of the tiny platform’s audio combo card. I meticulously folded the remaining cables and tucked them along the top and front of the case, taking special care not to impede ventilation or crowd our Trident Z memory modules. 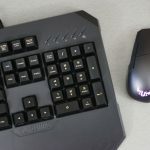 The Chopin’s list price of $99.99 USD is decidedly budget-friendly, particularly since it comes with a 150W power supply. The case can be found for as as low as $66 right now. With all of the hardware assembled, we were ready to get Windows installed and start gaming. I fired up a handful of titles with moderate system requirements. The goal was playable performance in the 30-50 frames per second range. A few tools proved invaluable for collecting data from our trial runs: Fraps and the Open Capture and Analytics Tool, otherwise known as OCAT, record performance statistics, while HWMonitor allowed us to keep an eye on temperatures and observe the utilization of each subsystem. AMD’s Vega 11 graphics engine is fast enough for an engrossing gaming experience at 1080p, and even 4K in some titles. 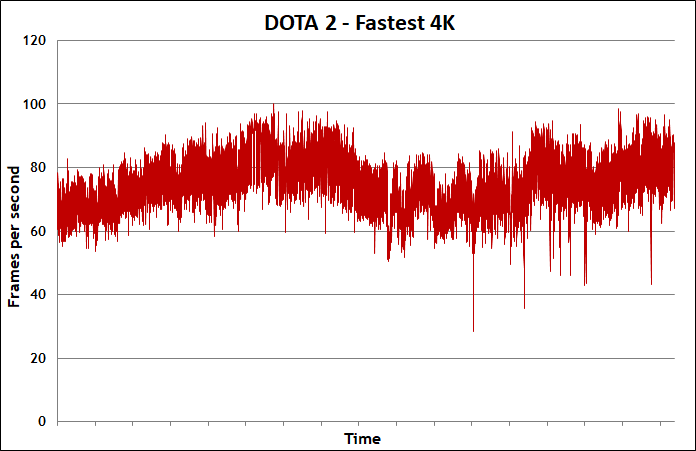 DOTA 2, for example, ran between 40 and 50 FPS during light encounters at the Ultra HD resolution. More grueling battles hit performance harder, causing it to occasionally fall below our target range. Race the Sun offers super-smooth 4K aerial antics. This is a great-looking game to play on a 40” TV with Vega 11 pushing above 100 FPS. Mark of the Ninja blends our love for classic side-scrolling platformers with stealthy action-packed gameplay. 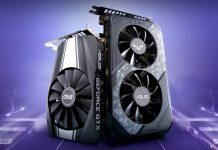 The FPS is locked at 60 and the visuals are strong but not particularly demanding, so Vega 11 integrated graphics kept the frames maxed even in rich 4K. 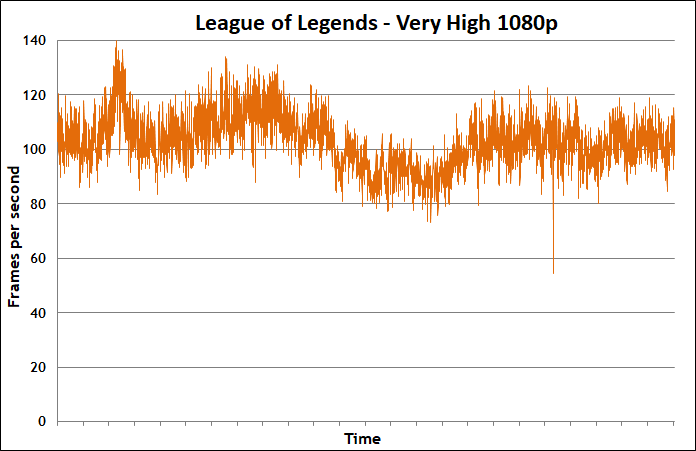 After scaling back to 1080p resolution, League of Legends offered up an experience similar to systems with mainstream add-in cards. Performance was consistently enjoyable, cresting 120 FPS during our test session. We also gave CS:GO a try to see if the twitch-happy title would run without hitching. The game is still insanely popular for good reason: it remains a blast and rarely dipped below our target frame rate. Fortnite was also highly enjoyable at around 50 FPS. Outdoor engagements did cause performance to dip below 40 FPS, but we think the game could still be tuned for higher frame rates if that’s too slow for your tastes. I can’t go too long without an Overwatch fix, and AMD’s on-die graphics engine didn’t disappoint with its ability to drive playable frame rates. I used a mix of mostly High quality settings, which yielded great-looking visuals on the big-screen TV. There is a big fluctuation in frame rate toward the tail end of our benchmark run—that’s because I switched to Pharah, whose Jump Jet ability puts more of the game world in view compared to heroes that remain on the ground and demonstrate more consistent performance. We then checked out Cuphead, another great indie side-scroller like Mark of the Ninja. It’s also capped at 60 frames per second, which was no sweat for our HTPC to maintain. During intense gaming sessions, the Noctua fan is audible if you’re listening for it. 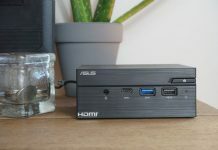 But during lighter streaming video playback, where much of the workload is handled by efficient fixed-function hardware, our HTPC’s fans are only perceptible during quiet scenes. In either case, noise doesn’t detract from the home theater experience. Next to a full-sized graphics card, our HTPC looks unbelievably small. This is, by far, the most compact system I’ve ever built, and yet it’s densely packed with powerful hardware. 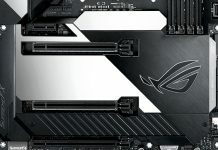 Starting with the ROG Strix B450-I Gaming motherboard gives our PC a potent platform with support for AMD’s versatile Ryzen processor with Radeon Vega graphics, lots of overclocked DDR4 memory, PCIe-based solid-state storage, high-end audio, and ample peripheral connectivity. Enthusiasts with a penchant for flair will appreciate the board’s configurable built-in RGB LEDs, along with Aura Sync lighting control to unify the effects of compatible peripherals. The InWin Chopin Mini-ITX case housing this system is all business if you look at it head-on in a home theater cabinet, but there’s plenty of metal mesh across the top and side panel. 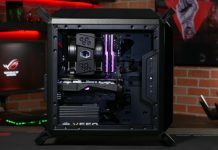 If you want the Strix B450-I Gaming to shine bright with illuminated memory modules and RGB LED strips, just stand it upright and bask in the glow.